Eat Drink and Explore with Melanie Young and David Ransom, Your Insatiably Curious Culinary Couple. We bring you the dynamic people who work front and center and behind the scenes in food, wine, spirits and hospitality. Our engaging short podcast series spotlights vintners, distillers and artisan beverage makers. Listen on iHeart.com and the free iHeart App. About The Connected Table LIVE! 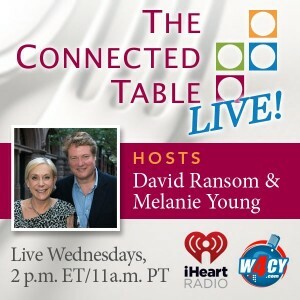 Editorial policy: The Connected Table LIVE! 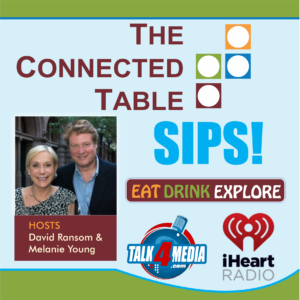 This 50 minute show is about storytelling and sharing the stories of individuals and legacy families around the world whose work has helped shaped the food and beverage industry. They could be chefs, artisan producers, vintners, master distillers, authors, farmers, and food/beverage industry thought leaders. There is no charge to be a guest on our show. Guests can call in from anywhere in the world, and the show is live and spontaneous. We also conduct shows on site. Our audience of listeners and followers includes both the wine and food industry and consumers who enjoy food, wine, spirits and travel. All shows are promoted through our social media feeds and our radio show station social media feeds. All shows are permanently podcast to major digital platforms, including iHeart/iHeart App, iTunes, Spreaker, Stitcher and more. iHeart is the world’s largest digital radio platform with more than 95 million downloads. All shows are streamed at Santé Magazine, a leading digital hospitality and food service industry magazine that reaches more than 350,000 readers. 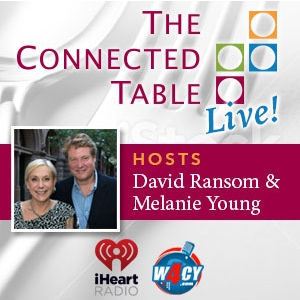 Enjoy both our written and audio content on our page “The Connected Table LIVE at santemagazine.com. Through our companion podcast series, The Connected Table SIPS! we produce custom, sponsored shows and affordable promotional campaigns for specific regions and destinations, marketing initiatives, brand promotion or special events. SIPS are also ideal for interviews with brand ambassadors, new winemakers and company spokespersons hired to promote a brand or campaign. Editorial policy: SIPS! are sponsored 5-8- minute podcasts with a companion blog and social media posts that run on a separate iHeart /iTunes channel (and other major podcast platforms) where they can be accessed anytime. We also provide clients an MP3 for their use. We work with sponsors to incorporate key message points and rehearse and record in one sitting. Podcasts can be conducted live or via phone or SKYPE, and our guests can call in from all over the world. We offer a series of 5 or more podcasts and we also offer one-off recordings and custom programs. Under The Connected Table LIVE! Both Melanie and David are available to moderate panels, speak at event or organize panel discussions both as part of or separately from a sponsored campaign. We accept press trips. If the trip is for a sponsored and/or dedicated show with companion blog we both need to attend the trip as a team. We can host shows on site from the destination if WIFI is available. Or we can host a follow up show post trips. Sign up for our weekly show newsletter.